by Steven D. Farmer, Ph.D. 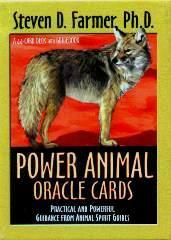 These cards "... are designed to help you clearly communicate with animal spirit guides in order to decipher questions you have about life concerns and access intuitive guidance to help you along your journey". Sounds easy enough. After all, we love animals, treasure them, respect them, so why wouldn't they become spirit guides. To help you make the most of these cards, a little book also comes with the deck which explains how to use the cards to do readings, both for yourself and for others. It also gives a detailed explanation as to each card's meaning and other possible associations. You can ask the cards any questions you need help with for answers and direction. Once you've made the cards your own, and with practice, you'll be able to make more accurate readings. How aptly named is Dr. Farmer? Visit Dr. Farmer's website at www.PowerAnimals.com. Conclusion - Why not explore animal spirit guides? Animals are God's creations too.